And Richard Leonard, it seems, fully agrees: “Austerity is a political choice and not an economic one,” he baldly stated last week. This is, of course, the position you would expect from a leftwing political party. It is also the correct position. 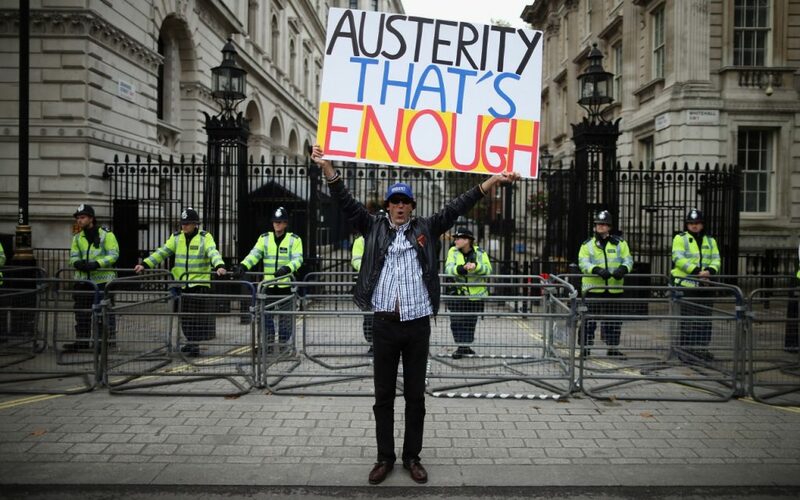 No serious economist believes that the Tories’ decision to embrace austerity after the 2008 crash was a good one. In fact, most experts think it was disastrous: Britain is now in the midst of the tightest squeeze on average wages since the 1800s; 30 per cent of British families live on or beneath the poverty line; the UK suffers from chronic rates of low productivity, consistently weak GDP growth, and unmanageably high levels of private debt. Austerity, in other words, doesn’t work, and anyone still peddling it as a response to an economic downturn is either a bullshitter or a quack. Which begs the question: why does the Labour Party continue to claim that an independent Scotland would be uniquely bound to a regime of massive spending cuts? Corbyn is referring here to the collapse of North Sea oil revenues and the resulting deficit the oil crisis has left in Scotland’s (projected) annual finances. The raw deficit figure is 8.3 per cent. That’s massive – the largest in the EU – and, one way or another, it would represent a serious economic challenge to an independent Scotland. But that’s all it would represent: a challenge, a problem, a hurdle, none of which, as you may of noticed, Scotland currently lacks as part of the UK. This leaves Corbyn’s position on Scottish independence – or at least the nature of his opposition to it – less than totally convincing. On one hand, at the UK level, he thinks austerity has been a terrible, politically-motivated mistake needlessly imposed by a capricious Tory elite. On the other, he argues that an independent Scotland would have no choice but to implement an amplified version of the Tories’ economic strategy in order to eliminate its deficit. That makes no sense. Worse, it actually mirrors the logic used by the right to justify austerity in 2010, which is a strange look for an anti-establishment leftist. Corbyn could, at a stretch, argue that Britain’s ‘broad economic shoulders’ are better equipped to deal with sudden gaps in spending than those of tiny peripheral Scotland. But that implies that there’s an inescapable relationship between a country’s size and its economic success, which there isn’t, really, unless you consider Sweden, Norway, Denmark, and Austria – none of which suffered as badly as the UK as a result of the 2008 crash – at some sort of vague or generic disadvantage in the global market place, which they aren’t. In reality – and I hesitate to say this because I like the guy, and really, really want him to dislodge Theresa May as PM – Corbyn’s approach to Scotland just seems lazy and opportunistic. He has never shown much interest in the specific dynamics of Scottish politics, so I suspect he’s simply reiterating anti-independence attack lines that he heard somewhere else or that have been fed to him by his advisers. The problem, however, isn’t just that those lines are wrong. It’s that they propagate the myth that large deficits mandate equally large cuts, and that, in turn, actively bolsters the Scottish right, which has long argued that independence would lead to austerity on an unimaginable scale for Scottish workers. This, as we have now established, is nonsense, because austerity is a political choice and not an economic one. Corbyn has repeatedly parroted the Scottish Branch Office line over Scotland since he came to ”power” . He has little credibility , I contend , with the majority of Scots on Independence . He is seen as an English solution to an English problem . The fact that his new man in the colony wanted to renationalise Scottish Water maybe tell it all. Of course our Brit of the left is fiercely anti independence, and a man who his right wing bunch of Red Tories would stab in the back at the earliest opportunity. Anyway I wonder what the forthcoming Arlene to Theresa call may bring. Sounds like the DUPe are just about ready to go mental..
Labour , nutshell = Grievance politics with regard to SNP , only suited to opposition to escape scrutiny , thats the whole point of abstaining – ambiguity. This generalization is inaccurate. It can work in certain circumstances and fail in others. Both Ireland and Greece instituted severe austerity measures after 2010. (Far more extreme than anything in the UK.) Ireland’s economy has recovered. Greece’s has not. It has lost 25% of productive capacity and shows few signs of recovery. Neither country had the option of devaluing since both are in the Eurozone. The Irish economy, beneath the ‘housing bubble’ which destroyed Ireland’s banks, was fundamentally sound. The Greek economy was weak. Further, austerity – combined with devaluation – has worked in the past in the UK; in 1931, in the late 1940s and in the early 1990s – when leaving the ERM amounted to devaluation. The problem for the UK since 2008 is that Britain does not really have an economic strategy to replace the Gordon Brown’s ‘no more boom and bust’/’light touch regulation’ ‘strategy’ blew up in his face. Abandoning austerity – if you are running a large deficit – means you depend on capital markets to keep financing you. Both Ireland and Greece found that the capital markets would not lend them money. They had to borrow from the ‘Troika’, who imposed austerity as a price for their loans. I can’t see capital markets rushing to lend money to a government led by Corbyn and McDonnell. When you have to borrow money to keep going, economics trumps politics. Absolutely. However, despite all his shortcomings, Corbyn is surely one of the most outspoken regarding the great political theft of public money and social deprivation. In view of the fact that right across Europe pro and anti nationalism is taking the centre stage, pushing many other social issues aside, marginal voters are realising that the prevailing threat of dire poverty is not being addressed forcefully enough by their ‘left’ representatives. You can see this in the Spanish Podemos and in other Mediterranean left wing parties, who are totally immersed in the nationalist debate. As the situation gets worse the hardest hit will undoubtedly eventually lose faith unless breakaway nationalist parties rise up to that other very real battle.